Rendering of Buffalo Heights development. 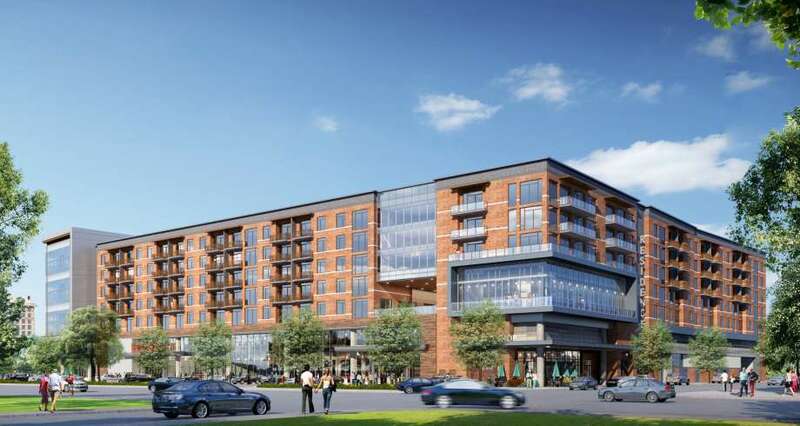 HOUSTON – Midway, a Houston development firm, has started construction near The Heights on a 7-story mixed-use building, anchored by urban-influenced H-E-B grocery. The project, owned by the Gordy family interests, is phase one of the Buffalo Heights District, a new development located on Washington Avenue between South Heights Boulevard and Studemont Street. “We’re marking a significant milestone for Buffalo Heights and the future of this corridor. It’s the unfolding of the Gordy family’s vision to create an innovative urban district in this thriving area west of downtown,” said Jonathan Brinsden, CEO of Midway. The new building will have a 96,000 SF H-E-B, three levels of boutique office space, 230 multifamily units and 2,000 SF of additional retail. Midway was tapped to redevelop the property on behalf of Russell Gordy, the project’s owner and founder and President of SG Interests. A groundbreaking ceremony was held at the Inner Loop Houston site on Tuesday. The H-E-B, purposefully redesigned to be different from the traditional single-level stores typically found in suburban locations. With an expected completion of spring 2019, this H-E-B helps cement the district’s goal of creating a walkable community where a healthy lifestyle is cultivated via easily-accessible fresh food, outdoor activity and outdoor spaces. The H-E-B will include a walk up coffee and food concept, providing both on-the-go and leisurely dining for residents and employees of nearby businesses. The new building also includes five levels of multi-family apartments (the St. Andrie), and three levels of boutique office (One Buffalo Heights). Buffalo Heights is a 50-acre mixed-use district located near Houston’s Buffalo Bayou Park, Memorial Park, The Heights, Washington Avenue Corridor and Downtown. Midway is a privately owned real estate investment and development firm that was founded 49 years ago The Midway portfolio of projects completed and/or underway consists of 45 million SF of properties in 23 states and Northern Mexico ranging from mixed-use centers, corporate headquarters, multifamily, entertainment, hospitality, business and industrial parks, and master-planned resort and residential communities. Headquartered in Houston, BKR Memorial is a privately held, family business under the management of Russell Gordy. In addition to the real estate investment and development business, Mr. Gordy has been engaged in oil and natural gas businesses, ranching, and a variety of other businesses in Texas, Colorado, New Mexico, Montana, Wyoming and throughout the U.S.
H-E-B, with annual sales of more than $23 billion, operates more than 370 stores in Texas and Mexico. A two-story H-E-B is under construction near Bissonnet Street in Bellaire.